Chris Buck Band is ALL IN. From auspicious beginnings to becoming a top charting country artist, this Canadian Country band is ‘boots on; let’s do it’, and they do it well. Upbeat, positive, and not one to waste a moment of life, Chris’ dedication and appreciation shines boldly through his songs, from upbeat anthems like “Giddy Up” to heartfelt ballads like “That’s When You Know” and the perfect mix of both, on his last single “Spin On It”.In 2017 Chris Buck burst onto the Canadian Country scene with his self-titled debut album, and the Top 20 hit “That’s When You Know”. The quintessential love song blew up, with more than 3.6 million streams and over 100 playlist adds on Spotify, a CCMA nomination for Video of the Year, 6 months of “Top 10 Most Wanted” on SiriusXM, and capped off the year with awarding the band “Album of the Year” at the British Columbia Country Music Awards, among many other accolades. 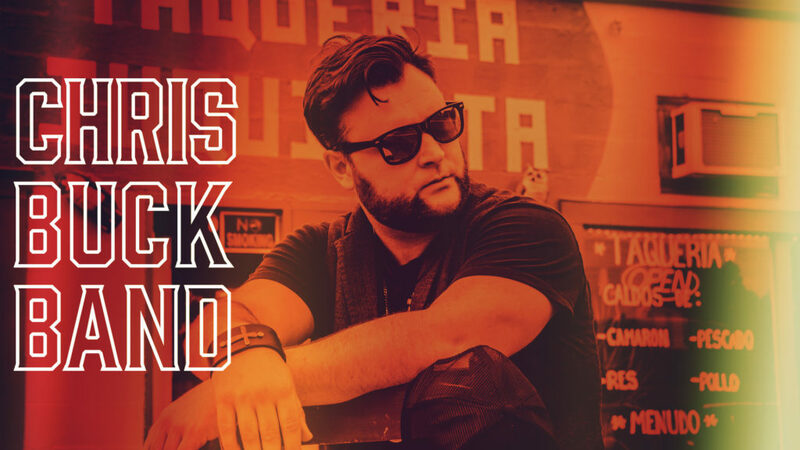 In 2018, Chris Buck Band is back with another get-stuck-on-repeat single called “RDNKN” guaranteed to light up the dance floors. Chris Buck Band is coming off a busy touring season across Canada, and an album release coming this fall.Though he played music from a young age, Chris was inspired to go “all in” and pursue a serious career in music after the death of a young musician friend whom he had mentored. For years the band rode the asphalt playing every show they could, honing their skills and growing a grassroots following. Signed in 2016 with Royalty Records / Sony Music Canada, Chris Buck Band’s self-titled 2017 debut album features 4x top 40 country radio hits including, “Leave Your Light On”, “Giddy Up”, “Sun Sets Down” and their Billboard top 20 radio smash “That’s When You Know” ft Kira Isabella. Now one of the fastest rising country music artists in Canada with a following of thousands of fans, Chris Buck Band shows no signs of slowing down, and packs a punch both live and on recordings. Along with Chris Buck, the group’s current line-up consists of guitarist Ryan Stead, bassist Matt Generaux and drummer Taylor Allum.